Have you heard the term Tin Pan Alley but had no idea what it was? 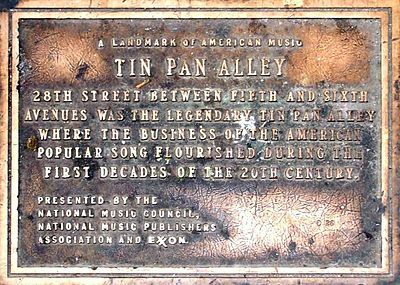 The term Tin Pan Alley refers to the songwriters and publishers of the late 19th and early 20th Century. 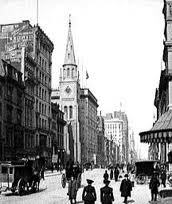 These men were all based in New York City and were originally located at West 28th Street between Fifth and Sixth Avenue in Manhattan. A plaque is now on the sidewalk in the area to commemorate it. Before their move to New York City, the publishers were scattered throughout the country. Monroe Rosenfeld is believed to coin the phrase in his articles as a derogatory reference. He wrote a series of articles for the New York Herald around 1885 and referred to the constant playing of the pianos which sounded like “tin pans being beaten in the alleyway.” During this time vaudeville was replacing the minstrel show. Over time the phrase was embraced and described the music industry in general. 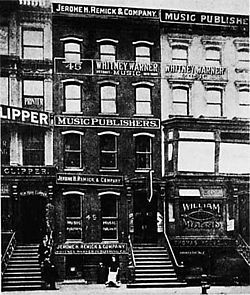 Vaudeville players often visited Tin Pan Alley in search of new songs for their acts. Composers and performers kept up with the times moving from the slow moving ballads to incorporating the cakewalk music, ragtime, blues and jazz tunes. Many of the lyrics of the day showed a happy, innocent time in small town settings. Irving Berlin published “Alexander’s Ragtime Band” in 1911 which gave Tin Pan Alley and Berlin their “crowning achievement.” It also changed the way America listened to music. Other large name composers with Irving Berlin were Cole Porter, George and Ira Gershwin, Frank Loesser, Richard Rodgers and Lorenzo Hart, Noel Coward, Gus Lahn and Jerome Kern and Oscar Hammerstein II. The end of Tin Pan Alley is not very clear. Some believe it was in the 1930s with the Great Depression. During this time the phonograph and radio crushed the sale of sheet music. Other sources believe the decline happened in the 1950s as Rock n Roll became popular and supplanted earlier styles of popular music. Truth be told it was probably a combination of both of these and the changing times. In 1959-1960 a short lived TV series was aired that took place in Tin Pan Alley.